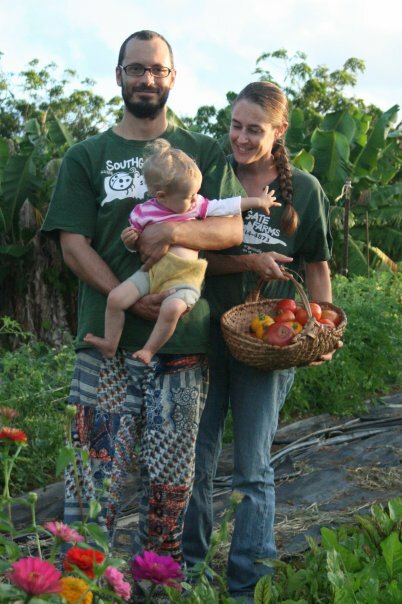 Luca and Christina Gasperi with their toddler during the last season of Southgate Farms, holding a basket of heirloom tomatoes, in a field of banana trees and colorful zinnia flowers. Artists and farmers Luca and Christina Gasperi started ARTfarm LLC in 2009, after nine seasons operating Estate Southgate Farms. Both farms have been non-certified organic vegetable and fruit production operations, on the island of St. Croix in the U.S. Virgin Islands. We specialize in high quality specialty salad greens, fresh herbs, heirloom tomatoes and cucumbers. We also grow tropical fruits and assorted specialty vegetables. We grow native plants and trees by contract for local preservation organizations. We also incorporate livestock (poultry and small ruminants) and beekeeping. We sell our produce at our farmstand on the farm one to three times a week for limited hours, for most of the year. Value-added, locally made products from artisanal producers are also available: fresh goat cheese, focaccia, I-Sha’s vegan ice cream (made from local fruits and coconuts), and exquisite local honey and meads from the Wanda Wright Apiary, among others. We also display our own and other artists’ work in our ARTbarn Gallery, near the entrance to the farmstand. Other outdoor spaces for the display of art are available, too. We welcome non-smoking volunteers to ARTfarm. Call us for more information. We hire one to four fantastic, enthusiastic non-smoking employees every year, who usually work somewhere between 15 to 30 hours per week for the entire season of five or six months. We do not yet offer housing, but it’s in the works. Laughing about something every day is an essential part of our workflow. A sense of urgency while working, the ability to take direction, and passion for farming are keys to success on a small diverse production farm. If you have those qualities and can enjoy a good running joke, please inquire about working here! One: Everything is Connected to Everything Else. There is one ecosphere for all living organisms and what affects one, affects all. Two: Everything Must Go Somewhere. There is no “waste” in nature and there is no “away” to which things can be thrown. Humankind has fashioned technology to improve upon nature, but such change in a natural system is likely to be detrimental to that system. Four: There Is No Such Thing as a Free Lunch. The directions to the farm are listed here.